Amsterdam public transport system can be confusing, but with my tips you will easily to find your way through the city. I will provide you with a printable map of the center of the city - the streets are U shaped and it's easy to get lost and difficult to find your way back to hotel. 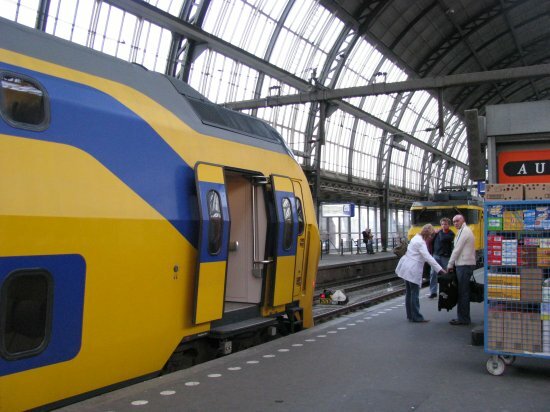 If you are arriving to Amsterdam's airport or train station, or leaving the city - you are much better off using specifically designated arrival/departure transfer than any public transport. The great tourist card is called the I Amsterdam City Card. 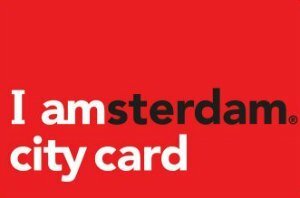 This card gives you free unlimited Amsterdam public transport access by bus/metro and tram + it gives your free entrance to 37 of the best known museums and a free canal cruise. Besides that it also gives you 25% discount to several attractions and restaurants. You can buy this card for one to three days. As soon as you come to Amsterdam, you will notice a lot of bikes - but you probably already knew that. Biking is a very comfortable and popular way of getting around the city that doesn't like cars - simply get a map and bike your way! The trams is a popular kind of Amsterdam public transport. They are a bit old-fashioned with their bells and wobbly way of going through the streets, but they go pretty fast and from the windows you can see what's happening around you. Traveling by tram is quite easy. Buy your day-card or IAmsterdam Card and check yourself in and out when boarding and disembarking with the yellow pay machines which you find on every station. You then enter the tram at the front and exit at one of the other doors. (push the button to open the door). All trams and buses have a number on the front and side of the tram, so you know which line this is and in the front you can read its destination, so you know if you will go the right direction. 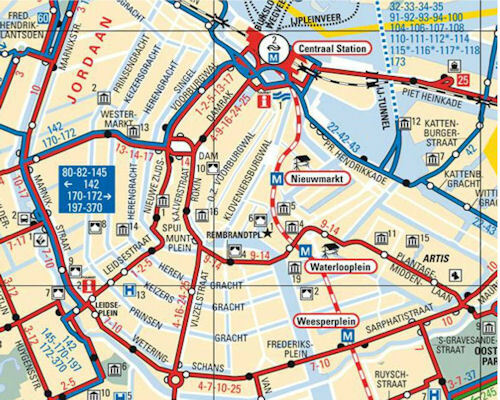 Make sure to pick up an Amsterdam public transport map so you can check which line you need in which direction. We made one for you too, free to print below. For your convenience we made a printable map with all the metro/tram and bus routes on it. Click on the map and you will get a PDF file to download and print for free. The public transportation of Amsterdam is served by the GVB. You can buy all the available tickets at the "Tickets and Info GVB" at the Stationsplein near the Central Station. There are several vending machines. You will find vending machines in the metro stations and you can buy day tickets at the bus and tram driver. There are interesting tickets for tourists like the multiple day pass from the GVB. Travel as much as you want with all buses, trams and metro lines in Amsterdam 24 hours a day. You can decide for how many days you want to buy this card. This card can be bought at the GVB Tickets and Info and the VVV (tourist information) at Stationsplein, near the central station.